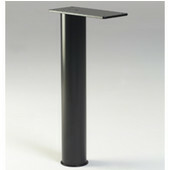 Durable's universal cabinet support posts are available in a variety of heights, diameters, and colors. These brackets boast a strong welded construction for unrivaled long-term stability. Durable's cabinet support posts can be used for attaching upper cabinets or transaction shelving to any desk system. They are available in both fixed and portable styles to meet your specific needs.